Assam Agricultural University caters the needs of the farming community of the North Eastern region and has been playing a vital role for socio-economic development. 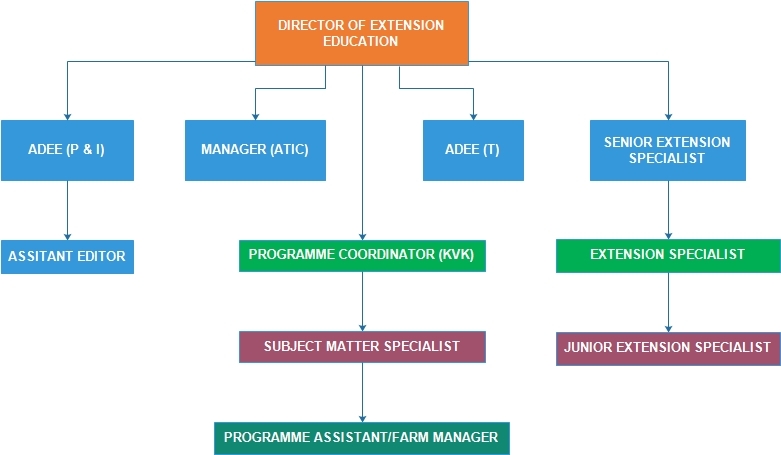 The Directorate of Extension Education has been maintaining liaisons with the Department of Agriculture, Govt. of Assam since inception. Also this Directorate has been maintaining linkages with other line departments of the NE states like Fishery, Veterinary & Animal Husbandry and Sericulture. The Directorate provides all necessary steps for adoption and dissemination of technologies evolved locally at AAU. Extension Education services to the farmers field has been warmly accepted by the farmers of the region. It has been reflected in boosting up of the crop production potentialities alarmingly. The area under HYV was increased and the farmers of the region were committed to adopt package of practices for both Rabi and Kharif crops. The Directorate of Extension Education provides ample opportunity for convincing and motivating the resource poor farmers of the region towards low cost technologies through its Krishi Vigyan Kendras (KVKs), Farmers visits to AAU farms and to Agricultural Technology Information Centre (ATIC) and through other farm related programmes. Apart from this, the Publication and Information wing of the Directorate regularly publishes Annual Reports, Newsletters, Farm Newspaper, Extension Bulletins etc. Besides, the technologies generated in the University are disseminated through electronic and print media. 1. Developing linkages between various govt. and non govt. organizations concerned with agricultural and allied e/xtension programmes. 2. Organizing need-based training for extension functionaries, farmers, farm women, rural youths and SHG members. 3. Advisory services to farmers. 4. Functioning as a centre for collecting, storing and disseminating information to farmers and extension functionaries. 5. Conducting demonstration for transfer of technology. 6. Entrepreneurship development in agriculture and allied areas.